I wonder how many of the applications we use today, either on the computer or our iPhone / iPod Touch, came to be with those five simple words. Wouldn’t it be cool if I could type something on my iPhone, the screen would go black, and the letters, in white, would display on the screen in big letters? On August 6, around 10:00 PM, that was the idea that struck me. Why can’t I type something on the iPhone, hold it up, and someone across the room could read what I wrote? The concept is so simple, yet after a visit to the App Store in iTunes, I noticed that no one else had come up with the idea yet. How odd. So, over the next hour, I used Pages on my Macbook Pro and wrote an outline, with pictures, to demonstrate how the iPhone app would work. 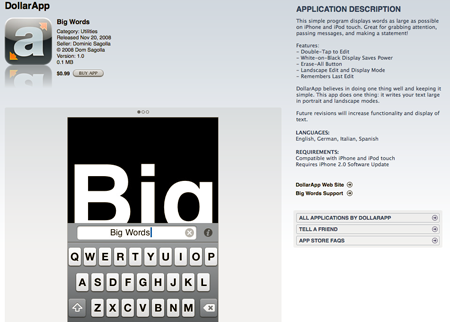 I named the app Big Words, because that’s what the app does: makes big words on your iPhone / iPod Touch! Now, I am not an iPhone developer. I am not any sort of developer. I understand the basics, and I can (kind of) speak the language. But there is no way on Earth that I could develop this software on my own. While I thought my idea was a good one, I wanted other opinions. People who would not feel compelled to simply tell me what they think I would want to hear. So I sent the PDF of my Pages outline to a few people, including Sam Levin, and all the feedback was very positive. Sam Levin, in fact, was so impressed with the idea that he insisted we find a developer to create it. Once we found a developer, Sam and I would use our considerable industry contacts to help promote and sell the App. I started talks with a few different developers, as did Sam. I had one all ready to go when Sam came back with a developer friend who he insisted would be perfect for the job. Long story short, through trial and error, we finally landed working with Dom Sagolla, an aspiring App developer who was looking to launch his own company to develop iPhone apps. His company, DollarApp, is where Big Words would wind up. There were some problems, but in the end, everything worked out great. After a few beta tests, and four final release candidate versions, Big Words is now live on the App Store, ready for you to purchase for the lowly amount of $.99! That’s right, a penny shy of a buck! There are, of course, future plans for Big Words in the months and years to come. I also have another outline for an App that I think could be just as good as Big Words. I hope that program, too, is released through DollarApp, although they have Apps of their own creation in the works, so who knows? Finally, I want to thank everyone who helped make my idea come to life. Sam Levin for getting behind the idea, and becoming my partner in all this. Dom Sagolla for actually taking my idea to the finish line. Beat Zenerino for his early work on Big Words. Mike Lee for his invaluable help on this project. And those who Dom worked with, listed here, that made Big Words a reality. Now go buy it, please!